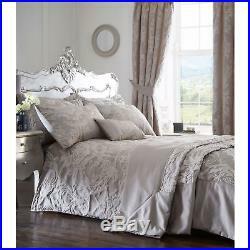 Classic Royal Howard Luxury Jacquard Duvet Cover Set Quilt Bedding Double Silver. Royal traditional jacquard patterns sit atop the luxurious Howard bedding collection. Dressed in subtle neutral tones evoking a classic chic look, the set can be accessorised with a luxury quilted throw, boudoir cushion and coordinating curtains for a complete and sumptuous bedroom look. Item: Duvet Cover Set Only Single Size Includes: 1 x Duvet Cover, 1 x Standard Pillowcase Other Sizes Include: 1 x Duvet Cover, 2 x Standard Pillowcases Single Duvet Cover: 140 x 200cm Double Duvet Cover: 200 x 200cm King Duvet Cover: 230 x 220cm Superking Duvet Cover: 260 x 220cm Standard Pillowcase: 50 x 75cm Front Material: 100% Polyester Jacquard Reverse Material: 50% Cotton / 50% Polyester Washing Instructions: Machine Washable at 40 Degrees. Our stock all ships from our UK-based warehouses. Only factory defects are accepted as a reason for a return. In the case of factory defects, we will replace the product for you. When returning an item, it must be in all of the original packaging and include all of the original accessories or items that came with it. We guarantee you only the best experience when shopping with us! The item "Classic Royal Howard Luxury Jacquard Duvet Cover Set Quilt Bedding Double Silver" is in sale since Monday, January 22, 2018. This item is in the category "Home, Furniture & DIY\Bedding\Bed Linens & Sets\Bedding Sets & Duvet Covers". The seller is "*raizean*" and is located in London. This item can be shipped to United Kingdom, Antigua and barbuda, Austria, Belgium, Bulgaria, Croatia, Cyprus, Czech republic, Denmark, Estonia, Finland, France, Germany, Greece, Hungary, Ireland, Italy, Latvia, Lithuania, Luxembourg, Malta, Netherlands, Poland, Portugal, Romania, Slovakia, Slovenia, Spain, Sweden, Australia, United States, Russian federation, Canada, Brazil, Japan, New Zealand, China, Israel, Hong Kong, Norway, Indonesia, Malaysia, Mexico, Singapore, South Korea, Switzerland, Taiwan, Thailand, Bangladesh, Belize, Bermuda, Bolivia, Barbados, Brunei darussalam, Cayman islands, Dominica, Ecuador, Egypt, Guernsey, Gibraltar, Guadeloupe, Grenada, French guiana, Iceland, Jersey, Jordan, Cambodia, Saint kitts and nevis, Saint lucia, Liechtenstein, Sri lanka, Macao, Monaco, Maldives, Montserrat, Martinique, Nicaragua, Oman, Pakistan, Peru, Paraguay, Reunion, Turks and caicos islands, Aruba, Saudi arabia, South africa, United arab emirates, Ukraine, Chile.